This tour will pick up from Cala D'or, Cala Egos, Calas de Mallorca, Cala Ferrera, Porto Colom and Cala Figuera. Please ensure that you select the correct ticket for the resort you are staying in. 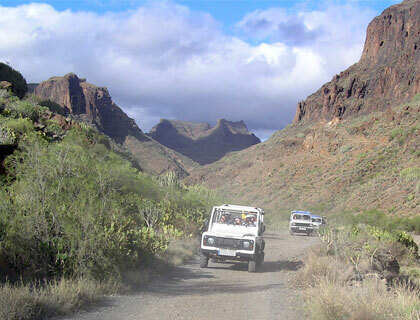 Jeep safari through the private land of Finca Masanella and Sierra Tramuntana Mountains. Round-trip transfers from selected resorts. We’ll email you immediately to confirm that we’ve received your booking. The specific details, including the local operator’s contact details, will be sent within 48 hours once they are confirmed by our supplier. Once you have arrived in Majorca, please call the number supplied on your e-ticket to confirm your hotel pick-up time. You will need to hand over a printed copy of your ticket when you are picked up. This tour will pick up from Cala Sant Vicente, Porto Pollensa, Alcudia, C'an Picafort, Playa de Muro and Puerto de Alcuadia. This tour will pick up from Arenal, Playa de Palma, Can Pastilla, Palma Nova, Magaluf, Santa Ponsa & Paguera. Availability: Mondays, Wednesdays and Fridays. Don’t Miss: Getting off the beaten track and exploring the real Majorca! This exhilarating Jeep Safari in Majorca is the ideal way to get off the beaten track and head up into the some of the most beautiful mountain ranges on the island! Travel up mountain tracks and across burbling streams on an exciting Jeep safari! Explore the beautiful private land of Finca Masanella. Head up the towering Sierra Tramuntana mountains. Includes round-trip transfers from various resorts and experienced guides. Led by experienced mountain guides, this Jeep safari in Majorca’s most beautiful mountain ranges is the perfect way to explore the diverse landscape, flora and fauna on this stunningly lovely island. Travel on tarmacked and unpaved roads, up mountain tracks and through gently trickling streams as you make your way through the 52km2 of private land at the Finca Massanella, and up through the towering Sierra de Tramuntana mountain range. Available from various resorts, the Jeep safari includes plenty of stops to drink in the views, a break for lunch, experienced guides and round-trip hotel transfers. Tuesday and Saturday from Eastern Resorts. Tuesday, Thursday and Saturday from Northern Resorts. Monday, Wednesday and Friday from Southern Resorts. Please note that occasionally the days on which this tour operate may change. In this case, we will book a day as close as possible to your original preferred day. If this is unsuitable, a full refund will be given. Pick-ups are at 8.30am from your hotel or a centrally located meeting point. Please make sure you are at the meeting point by 8.15am. Drop offs are from 6.30pm. Please call the number on your voucher to confirm your pick-up time once in the resort. Drivers must be 21-years-old or over and hold a clean driving licence. Please note that if you do not wish to drive but simply enjoy the lovely scenery then that is absolutely fine. Unsuitable for pregnant women, children under 3-years-old and passengers with mobility problems. Safety is paramount on the Jeep safari. Full safety instructions will be given by the guides before departure. Eastern Resorts: Cala D'or, Cala Egos, Calas de Mallorca, Cala Ferrera, Porto Colom and Cala Figuera. Northern Resorts: Cala Sant Vicente, Porto Pollensa, Alcudia, C'an Picafort, Playa de Muro and Puerto de Alcuadia. Southern Resorts: Arenal, Playa de Palma, Can Pastilla, Palma Nova, Magaluf, Santa Ponsa and Paguera. Please be sure to select the ticket which includes your resort.